When I was in school my understanding of hormones, and what I was taught about them, was pretty basic. At the time I was quite content to learn specific physiological effects of the individual hormones, commit them to memory, and hope to remember all I had learned for the future. Well, it turns out that the learning is far from over and hormones are far more complex than I had ever imagined. As the scientific community continues to study hormones, more of their functions are elucidated. As a Naturopathic Practitioner and a female, I have seen and felt how a woman’s monthly cycling hormones effects her moods. We know many women become irritable, anxious and sad, crave salt and/or sugar and can have difficulty sleeping just prior to menstruation. We also know many women whom, during Menopause, experience the same set of symptoms and more, often to a greater extent, and more erratic than typical PMS. When we experience these symptoms, it becomes very clear that hormones like Estrogen and Progesterone have far greater functions than just exerting effects on the reproductive organs. Below I have listed some hormones and how they influence Neurotransmitters. Neurotransmitters are the chemicals that communicate information throughout our brain and body. 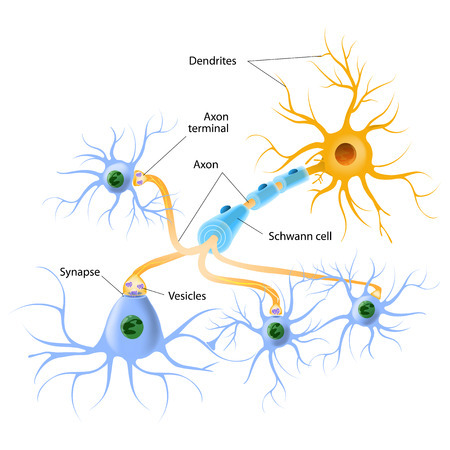 They send signals to nerves and switch on, or off, an activity. The brain releases neurotransmitters to tell your heart to beat, your lungs to breathe, and your stomach to digest. They can also affect mood, sleep, concentration, and weight. When out of balance, neurotransmitters can cause adverse symptoms such as anxiety and depression. *Information provided by Sunesco International Inc.
Neurotransmitters are either excitatory or inhibitory. Excitatory neurotransmitters function to stimulate the brain, help with focus, increase energy and motivation, and stimulate certain physical responses. When too high or too low we can experience fatigue, depression, sleep difficulty, digestive issues and even an increase in allergy symptoms. Inhibitory Neurotransmitters function to calm the brain and help promote balance. They balance mood, promote healthy sleep, exert a feeling of wellbeing, and can even modulate pain. If you’ve ever visited a Naturopathic Doctor you have probably had the experience of being asked many questions about stress, moods, energy levels etc… The reason we are asking so many questions, when you have come in because you are losing hair, or are feeling irritable, is because we understand that the presenting symptoms are most likely due to something else, like hormones, being out of balance. To adequately treat the symptoms we seek to find the cause. Its not that the symptom is not important, but if we don’t look beyond symptoms, then chances are there will be a return of symptoms, or we will always be chasing symptoms. If you are interested in being well then I invite you to come have a visit with me, or one of my colleagues at Vitalia Health Care.